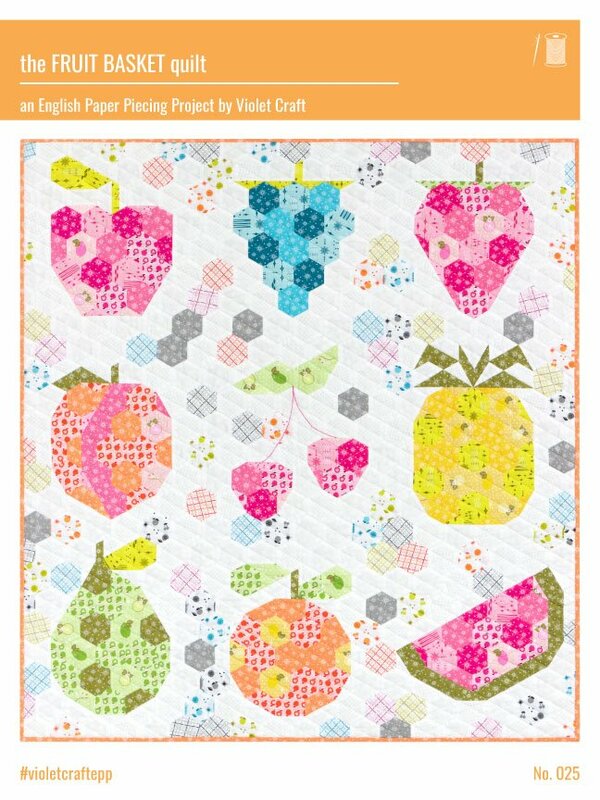 The Fruit Basket Quilt is an English Paper Piecing (EPP) project booklet containing 9 individual small projects perfect for wall hangings, pillows and more, or combined into a larger quilt design as shown on the cover. English Paper Piecing is a technique where fabric is wrapped around paper templates and secured with basting stitches or glue. The pieces are then sewn together by hand with a tiny whip stitch. This project includes English paper piecing instructions using the recommended glue basting technique. This pattern uses standard hexagon templates, which you cut apart to make several different shapes. The size of your starting hexagons determine the finished size of your project. You can theoretically use any size hexagon templates, although very large or very tiny templates will be more difficult to piece. Hexagons are measured in size by the length of an edge. Fabric requirements and sizes are provided for the recommended sizes of 1” and 1.5” hexagon templates. The pattern includes (100) 1.5” hexagon templates to get you started. Finished quilt sizes are: 32” x 35” if using the 1” hexagon templates or 48” x 53” if using the 1.5” templates.